Traders reacted immediately to Draghi’s forthright resolve, and a week after his speech the ECB announced a program to buy the bonds of its distressed countries, known as Outright Monetary Transactions. 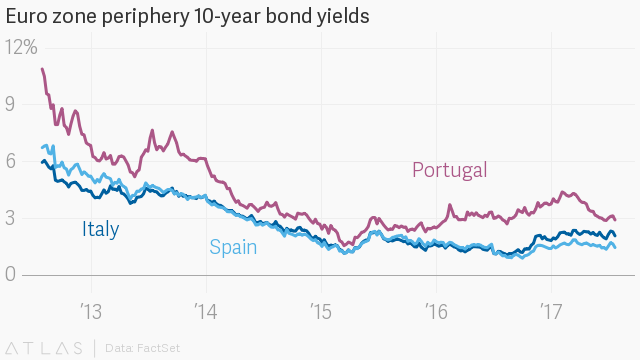 Although the ECB never ended up using this program, the promise was enough to calm investors and bring down bond yields across the euro zone. The ECB eventually launched a bona fide bond-buying program in early 2015, but most of the improvement in the euro zone’s weakest members’ borrowing costs was achieved purely by Draghi’s verbal interventions. Today, traders are as bullish on the euro as they have been in many years, and the IMF just upgraded its forecast for the region’s growth prospects. In the surest sign that the region has turned a corner, Greece returned to the market this week, finding eager investors for €3 billion ($3.5 billion) of government bonds.